The history of mankind is the constant rivalry. The one who is fighting with a sword confronts with the one who is protecting himself with a shield. Hence, the history of a shield will be discussed now. The shape of a shield was modified as the time went by. The material that it was made from differed depending on a time and place or emergence. 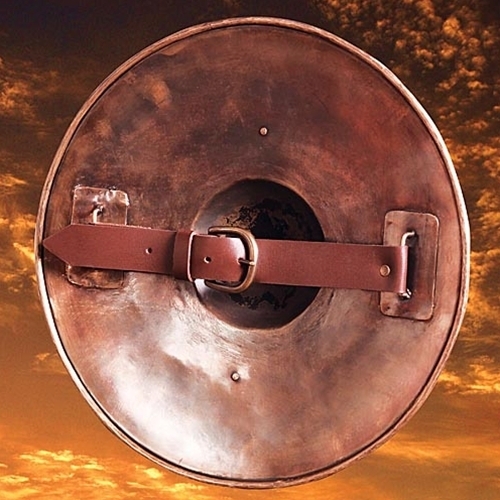 In films, metal shields are most common to see, as they make better sound effects, but in fact, they were not that popular. It must be admitted that they appeared in the ancient armaments, but they were quickly resigned of. The medieval knights used only wooden shields, enhanced with parchment, linen or leather. As a they had quite wide surfaces, they were covered with drawings. In the ancient times, these were the images of monsters which were supposed to scare the enemy. Later, they were replaced with the hallmarks of particular units. This custom was continued in the Middle Ages, when coats of arms were put on them. They made it possible to find out who is coming. The names of defensive armaments, the same as of weapons, are very diverse. When the Empire fell, the Early Middle Ages started and then, a perfectly round shield was the most common. It was produced entirely from wood and sometimes improved with edge fittings. Such a shield was held similarly to a Roman scutum, by grabbing a bar placed in the middle. It happened that a patch was also strengthened with iron fittings. This form was common up to the 10th century and sometimes even appeared in the 13th century. However, when cavalry became more common, in the 9-10th century iconography a kite shield originating, from the Normans, can be usually observed. It had a prolonged shape, rounded at the top, tapering to the bottom and ending with a slight bow or a spike. It was the Normans who made it so common all across Europe, after they adapted it from France. Its size made it possible to cover a warrior from his shoulders up to the half of his calves. It was produced from wood and covered with leather, linen or parchment. There was iron fitting at the edges and an umbo in the middle. During a battle, it was hung at a neck and, hence, it was easy to manoeuvre it. As the time went by, relying on the battle experience and as a result of the defensive armament development, a shield was shortened. In the 13th century, a typical triangular knight shield emerged and it was used in various versions throughout the whole 14th century. One of the most popular variants was heart-shaped. In the 13th century, a pavise of Prussian origin also went in use. It was a shield made of wood, with a leather or linen covering, shaped like a rectangle or a trapezoid. It was additionally enhanced with a vertical protrusion running through the centre of a shield. On the inside, a handle was placed. There were two kinds of this defensive armament. The first one was small and used by cavalry and the second one – much bigger and used by infantry. It was so huge that sometimes it had to be leaned on a pole. In other to enable observation from behind such a shield, a peephole was cut in it. 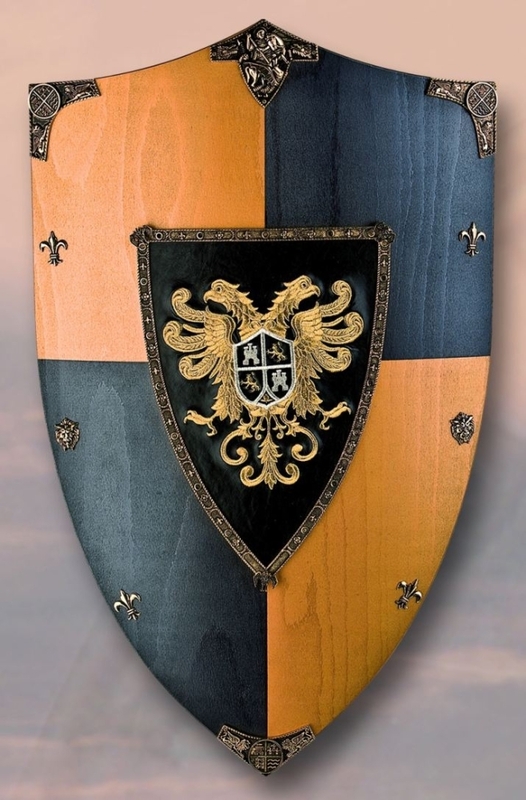 The name of this shield originates from the Italian city called Pavia, where it reached thanks to the knights fighting in the guest troops of the Teutonic Order. In the 15th century, a jousting lance gained more importance in a battle and a shield was given a shape of an irregular rectangle. For instance, in Hungary, it was a quadrangle, one side of which transformed into a spike with a notch to base a lance. However, when firearms were introduced, both shields and swords began to be more and more rarely used in the battlefields. In the 16th century, the only army using pavises were the mercenary German shield bearers. Sometimes, they used also small metal shields produced in Nuremberg. They usually were not much bigger than a hand and they constitute the only example of metal shields in the Late Middle Ages. But for few exceptions, such a wooden shield used by the hussar cavalry, they disappeared completely from the battlefield. Two other kinds of shields worth mentioning are kalkan and sipar. The first of them was a rounded, convex, light model made of fig bars and entangled with silk or wool threads. It was enhanced with a metal umbo, sometimes decorated with precious stones. Kalkans were characteristic mostly for Turkish, Tatar and Persian armies. However, they were also known in China, Mongolia, India and Arabic countries. They were adopted by some European countries as well, such as Hungary or Poland. 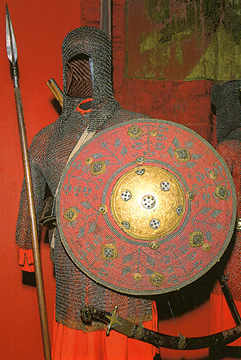 Kalkans were used even in 17-18th centuries, when shields were not popular any more. Sipar is a shield originating from the 15th century Persia. It was equipped with four or six bumps and carefully ornamented, most commonly with a crescent moon. Both kalkans and sipars had lining of quilted fabric on the inside. The myth of metal medieval knight defensive armaments originates from the Renaissance popularity of shields decorated with bas-reliefs or inlaid precious stones. They were ordered from the greatest masters of armory to the courts all across Europe. They were used during parades or as an element of the palace guards' equipment. As they were made of metal, they have preserved in perfect condition to the present times, contrary to the wooden shields. That is why some early scholars considered metal shields to be the standard ones. Shields finally disappeared from battlefields in the 18th century, when they were completely superseded by the lethal firearms. However, it happened that it was coming back for a while. There is information about the experiments conducted by Germans during the First and Second World Wars, concerning this kind of protection. Nowadays, it is used by the police special forces all around the world. Such a shield is manufactured from plastics and serves as protection from aggressive demonstrators and sports supporters. Another type, made of Kevlar and steel composite is used by anti-terrorist squads to defend from bullets and shrapnels. It can be observed, therefore, that an invention created thousands years ago still plays its most important role – it protects a human life. Our shop offers you highest-quality copies of defensive armament originating from various cultures and historic periods. 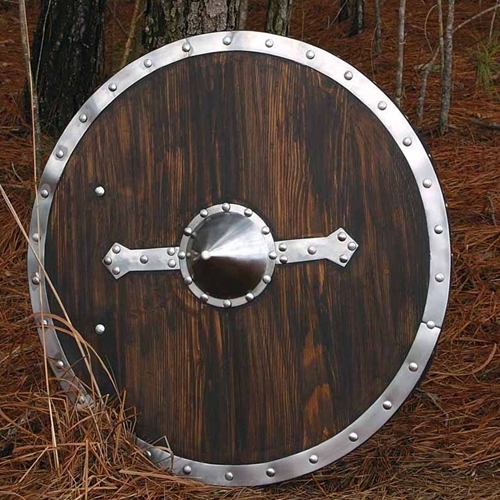 You can order, for example, a Viking, Roman or medieval knight shield replica, which is based carefully on the prototype. The original exemplars are usually highly damaged as time passed by, especially the wooden models. Thanks to our products, you can find out how they really looked like when they were in use and how it feels to touch and hold them in your hand. It is a great idea for a unique gift or a marvellous prop for historical reenactment.